Coach John Cook took to the podium for his first Monday press conference of the year following Nebraska’s 1-1 showing at the VERT Challenge this weekend and had mostly good things to say about what he saw from his young team. Nebraska lost to then-No. 7 Florida 3-1 on Friday then followed it up with a sweep over No. 18 Oregon on Saturday. The Huskers dropped to No. 5 in the latest AVCA Coaches Poll while the Gators jumped to No. 4 and the Ducks stood pat at 18. Cook compared this year’s team to last year’s at this same point. The 2018 Huskers went 0-2 in the VERT Challenge with losses to the same teams they played this year. Cook said the biggest advantage of taking on two top-25 opponents in the opening weekend is the experience it provided for the freshmen and sophomores. Sophomore Jazz Sweet is caught somewhere in between being a veteran and still figuring things out as a young player. She started all last season at the opposite hitter spot and will be counted on for consistent production despite only having one year of collegiate playing experience under her belt. Sweet finished with 13 kills and four errors on 33 swings (.273 hitting) and followed it up with eight kills and five errors on 21 attempts (.143) this weekend. As for the other side of the court, Cook issued a clear message to his freshman (Capri Davis) and sophomore (Slaughter) battling for the second outside hitter spot. Both players saw action over the weekend. Another option at that spot long-term is Texas transfer Lexi Sun, but she remains on the shelf while recovering from injury. 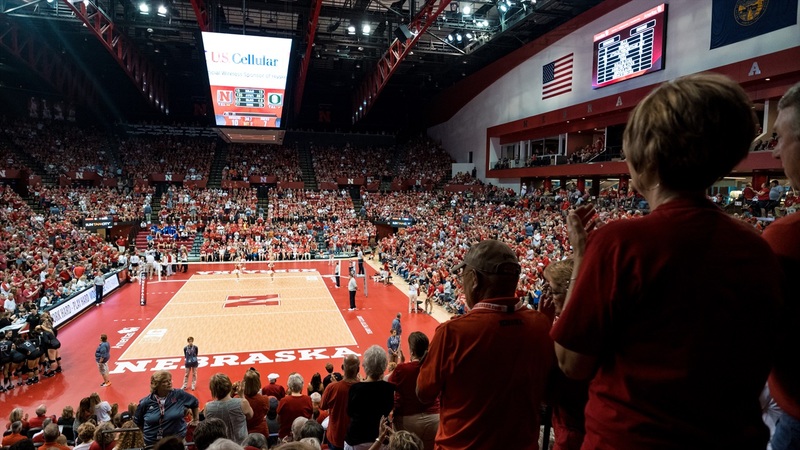 Speaking of this weekend, the Huskers are hosting another tournament at the Devaney Center, the annual Americas Players Challenge. Nebraska will take on Ohio at noon and Wake Forest at 7:30 p.m. on Friday and then will close out the event against Santa Clara on Saturday at 2 p.m.